"In Dice Masters, two players take the role of masterminds directing the actions of a team of powerful supers (represented by dice) to battle each other! Each turn, you’ll roll your dice to see what resources you have available, buy dice, send your team members into the field, and then strike at the enemy mastermind. Reduce the opposing mastermind’s life to zero, and save the day!" I'm rather fond of the world I live in. There are dragons and Jedi, Hobbits and gaming nights, general tomfoolery and endless bouncing around in-between speech bubbles and spandex. There are virtual consoles, steampunk coffee dens, cyberpunk cities and life-altering quests that define your very purpose for being. There are comic-book fights, movie nights, table-top debates and superhero dates. There's always a guest for a jest and time for a rhyme. There are no frigging Kardashians. Or Ciley Mirus, Banting lettuce burgers, corrupt politicians or wars. Well, okay, there are wars and they are fought by real (corruptible) people with real tears and occasionally real blood caused by paper cuts but at the end of it, they all just concede or share a victory toast (peanut butter crunchy), pack up and leave. Generally, there aren't many casualties and the clean up just involves dumping the pizza boxes and empty bottles of mountain dew. Aaand, it's a fun world. Like see, I can stretch 'And' at the start of that sentence and not give a hoot about language constructs. Bugger it. I like my world. My world is not round. It's square...and six sided. In my world I'm not tied to any movie studio rights. Wolverine is in my Avengers squad. As is Spiderman and he's in a frisky affiliation with the Black Widow. (Sorry MJ, but the Russian legs on that Tsarina...nuff said!). And, oh, Zac Snyder, phsshhh to you for making us wait till 2016 - I just put both Supes and Batman into my squad and guess what? They're buddies! Yeah, hows that for the bromance supercop good-hero/ bad-hero routine? And I threw in some dragons from the Dungeons and Dragons set because who doesn't want to see Aquaman get fried by a Dragon? A garlic loaf and a chopped salad and we're all set for a fish-braai. So, what am I ranting about? Dicemasters - designed by Mike Elliot and Eric M. Lang, this collectible dice building PvP gem is based on a similar gaming mechanic to Quarriors with a blend of Magic: the Gathering. 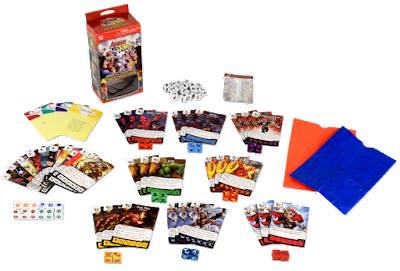 In Dicemasters players draft a team comprising eight superheroes, villains, monsters or characters from a pool of cards along with the associated dice that goes with these cards. Players then take turns, rolling and drawing dice and spending ' energy' to recruit more characters and resources and assemble their version of Earth's mightiest (or nastiest) team. Dicemaster sets retail at around R250.00 to R300.00 for a two-player starter with sets sourced from the Marvel, DC, Dungeons and Dragons and even the Yugio universes. Booster packs feature two characters and two associated dice and retails at around R18.00 - R20.00. Not only are the sets affordable but you are guaranteed playable characters with each booster pack you buy which adds to the overall awesomeness of the game. There are various flavors of card types: common, uncommon, rare, super rare and even some promos which adds to the 'collectibility' aspect of the game. In terms of complexity and play, this is not a difficult game to learn. A typical match lasts anything between 20 minutes to 40 minutes and you will want to play at least 3 rounds. As with other genres, there is a deck-drafting element to the game and, as all the sets are compatible, you can customize your team however you see fit. So mix up the Avengers with the Justice League or the X-Men with a few Batman characters - it's all fair and fun in Dicemasters. Affordable - Honestly, apart from Star Realms (another great deck-builder by the way), I have yet to find a game that is as friendly on your pocket as it is fun. The starter sets retail at around R250.00 and is a fully playable, out-of-box, two-player game. The variety. There are currently about 7 various Dicemaster starter pack options to choose from: In the Marvel range: Uncanny X-Men, Avengers VS X-Men, Avengers: Age of Ultron. Easy to learn and easier to play. And fun for kids. I really recommend you check out the Watch it Played YouTube channel, the gaming duels between Rodney Smith and his son Luke is schweet! You get to mix up teams from different universes because it's all one BIG multiverse. My current team is more Marvel heavy but I have a few DC characters and a few more from the Dungeons and Dragons set. The gaming mechanic is fun, fast and flows like a well-oiled (war) machine. Rolling dice is always fun but here, having a re-roll option, adds an extra kick to the chance-element of the game. The collectibility element. Sure, collecting cards is fun - but collecting cards AND dice is two more levels of fun. For events, check with the retailers listed above for Gaming-meetups and friendly tournaments.